If the thought of climbing a mountain sends shivers of excitement down your spine, you might be a "peakbagger." Peakbaggers are a rare breed of people who love to climb big mountains for the pure joy of making the summit. The tallest peak in the contiguous United States is Mt. Whitney, and thousands of eager peakbaggers hike this summit each year. Training for Mt. Whitney or any peak requires extensive physical conditioning and altitude acclimatization. 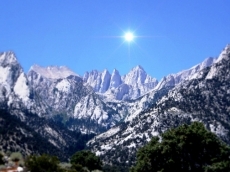 Depending on your current physical condition and level of experience, the preparation required to hike the Whitney summit can take several months or even years of preparation. If you are in the median range of a little hiking experience and in moderate shape, the preparation should begin at least one year from the actual departure date. This middle-of-the-road hiker should be aware that swapping the TV set and cushy couch for panoramic views and hiking boots is always risky. Go pay a visit to the doctor for a checkup and explain to loved ones that you can no longer squelch the call of the wild. Once you have verified that it is safe to leave the couch and pacified loved ones, it is time to get started on conditioning hikes. The rule of thumb is that you should feel only mildly sore, but not in pain after each hike, and then allow at least one day off between hikes. This resting time allows the muscle tissue to heal and rebuild. On the "off" days, you can add some upper body activity such as push-ups and sit-ups, but keep it light and lean. Hikers prefer to be more aerodynamic and light on their feet as opposed to developing bulky muscle mass. Build your foundation of strength with Long Slow Distance (LSD) walks for the first 30 to 60 days before adding hills of any significant size to your routine. Mix in some beach walks and easy yoga to develop balanced muscles that can navigate on rough terrain. Once a foundation is built, you can add bigger hills to your hikes to develop climbing muscles and cardio. When distance + hills are getting easy, begin wearing a small pack with 5 pounds of water in it. If the pack becomes heavy, simply empty the water out. Altitude training is a must, but this comes after you have developed stamina at lower elevations. The key to successful "peakbagger" training is to allow plenty of recovery time in between hikes and to decrease your hiking if something becomes painful or sore. Listen to your body, a small injury is the most common reason for people to fall off their training program. Sufficient recovery time will ensure you increase strength without causing injury and make your "peakbagging" dreams come true.